Afternoon all! I write to you in an extremely fragile state after just making it back from a weekend away in Riga! Being the slightly tight (and very sensible) people that we are, we chose the most horrendous budget airline – Ryanair. For those of you who have never heard of them, they are masters at ‘up-selling’. Upgrades include every time of insurance that you could imagine, suitcases, check-in baggage, priority boarding, choosing your seat and (obviously) all food / drink etc. Did I mention that it costs £70 to have your boarding pass printed at the airport if you forget to do it yourself?! Don’t get me wrong, we all had an amazing time… but a 3 hour flight with no legroom and no fresh air doesn’t do well for an already delicate being! I’ll update you all on the trip later in the week when I can actually stomach thinking about bars. OUR BOOK HAS BEEN LAUNCHED!! So if you haven’t already heard the big new of the day, the eBook that I co-wrote with a group of 11 other bloggers has been launched! 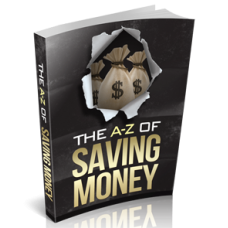 The A-Z of Saving Money is a 26 chapter collaboration of Personal Finance hints tips and tricks. It is priced at less than $15 and makes a great ‘filler book’ – you can pick it up and read snippets at a time. Each chapter has a different theme with a different author’s take on the topic. You are essentially getting 26 mini books in one. I’m not going to lie – when I was proof reading the book as a whole, I struggled to put it down… I must admit I learned a good few things too! Congrats mate! That is huge!! Glad you made it home safe and sound. Glen sent me a copy of the book to review and I was really impressed. Good stuff indeed. Kudos! Pleased to be a co-author. I’m glad you made it home. I hate flying these days and am always glad to be back on solid ground. Great job on the e-book! Ha! ….thinking about bars….that sounds like a story your head doesn’t want to remember but that we’d love to hear ;-). Glad you are home safe and sound. Happy to be part of the ebook with you! I just submitted to Amazon so hopefully that gives things a move on.